Families are invited to the Guilford Green at 9:30 AM to gather with local churches for a blessing. We will return to St. George for the 10:00AM Mass. 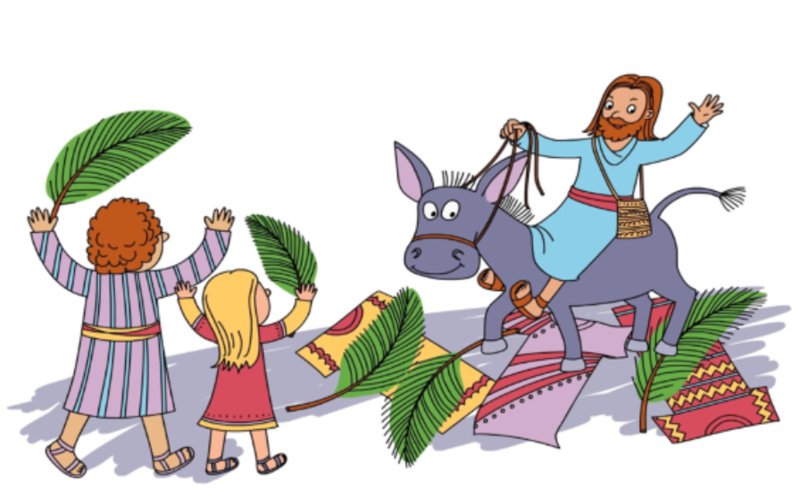 After the blessing of the palms at Mass, children in grades PreK – Grade 3 will gather at the altar and Father will dismiss them downstairs where we have a special Palm Sunday class. We will have a bible lesson, make palm crosses and end with an egg hunt on the lawn. Parents will meet their children in the Church Hall after Mass for a pancake breakfast provided by the Knights of Columbus. Please RSVP to Cara at ccorrell@stgeorgeguilford.org or 203-453-2788 ext 204 to let her know if your children will attend this event. All parishioners are invited to attend the Chrism Mass on Tuesday, April 16 at 11:00AM at the Cathedral of St. Joseph, Hartford. Please note that the Parish Office will be closed that day so the staff is able to attend the Mass. All materials are provided to create a pallet sign. You will be able to choose from 6 designs when you register online. Prepayment is required. Registration closes April 19. Submitting your stencil choice and prepayment will reserve you a spot for this fun night. Please feel free to bring an appetizer or dessert to share. For any question and to RSVP for appetizer or dessert, please email Cara Correll or call 203-453-2788 x204. Each day will begin with Mass and include a service project and group activities. Some of the projects this year include; “Box of Joy” and “A Place Called Hope” as well as local organizations. Camp t-shirt, snacks and water are provided. Please pack a lunch (refrigeration and microwave are available). A camp fee of $25 per student will be used to support daily activities. Space is limited to 25 students. Please complete and return the registration form to St. George Church, 33 Whitfield St., Guilford, CT 06437 .Registrations are processed as received. A waiting list will be created if necessary. Please contact Lori or Cara at 203-453-3496 for more information. Our Catholic Church and our own Parish of St. George have made the commitment to provide the safest possible environment for all minors and vulnerable adults entrusted to our care. The Archdiocese of Hartford has chosen Virtus: Protecting God’s Children for Adults as the program to be implemented for all employees and volunteers who have contact with minors or vulnerable adults. In this training you will learn best practices for keeping children and vulnerable adults safe while in your care, as well as how to identify behaviors that may indicate a child or vulnerable adult may be experiencing abuse in another area of their life and what to do if you suspect such activity.